In a world where the existence of shifters, telepaths, and all kinds of ‘paras’ has become common knowledge, a world where everyone is marked at birth with the name of their fated mate, Sanctuary is one of the few places where paras can be who they are without fear, and love without restraints. Meet four of Sanctuary’s fiery, flower-named ladies, and follow their journeys toward love, acceptance and freedom: Violet, Hazel, Marigold and Rose. 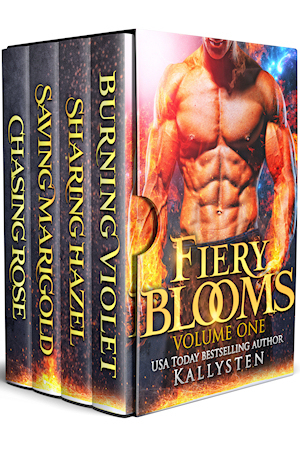 NOTE – This book gathers 3 novellas and 1 short story, all stand-alone parts of the Fiery Blooms series.